1929 – In the year of the World Exhibition in Barcelona the school first opened its doors. The wealthy confectioner Augustí Massana was its generous donor and founded the academy for design in industry and artisan craftworks. With this he anticipated the future connection of industry and arts and set on design early on. The Escola Massana: A confectioner’s dream. 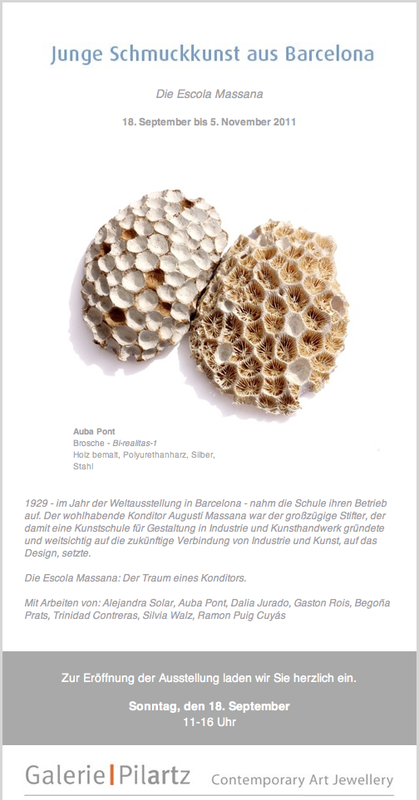 Next Sunday September 18th is the opening of the exhibition “The Escola Massana” at Galerie Pilartz showing jewels by teachers and alumni of this school in Barcelona. The exhibition will be open until November 5th. El proper diumenge dia 18 és la inauguració de l’exposició “The Escola Massana” a la galeria Pilartz on es mostraran joies de professors i alumnes d’aquesta escola de Barcelona. L’exposició serà oberta fins el 5 de novembre. Alejandra Solar, Auba Pont, Dalia Jurado, Gastón Rois, Begoña Prats, Trinidad Contreras, Silvia Walz, Ramon Puig Cuyàs. This entry was posted by Montserrat Lacomba at 7:28 am. | This post has no responses. This post is filed under Blog, Exhibitions, Germany, Spain and tagged with Alejandra Solar, Auba Pont, Barcelona, Begoña Prats, contemporary jewelry, Dalia Jurado, Gaston Rois, Massana School, Ramon Puig Cuyàs, Silvia Walz, Trinidad Contreras.